On January 6th, 2017, members of the Tobacco Free Partnership of Okeechobee had the privilege to speak about tobacco prevention and education in Okeechobee County during our local Legislative Delegation meeting. Courtney Moyett, a member of the Tobacco Free Partnership of Okeechobee, spoke about the newly released local data from the Florida Youth Tobacco Survey that shows that cigarette use in Okeechobee county is decreasing while the use of electronic cigarettes is on the rise, as well as the most recent FDA deeming regulations for Electronic Cigarettes. Moyett also gave an overview of our local SWAT (Students Working Against Tobacco) Clubs, a brief breakdown of the cost of using tobacco, and an overview of the events that are being held in Okeechobee County for tobacco prevention this program year. Also discussed was the allocation of tobacco prevention funding through the Florida Constitution, Article X, Section 27. 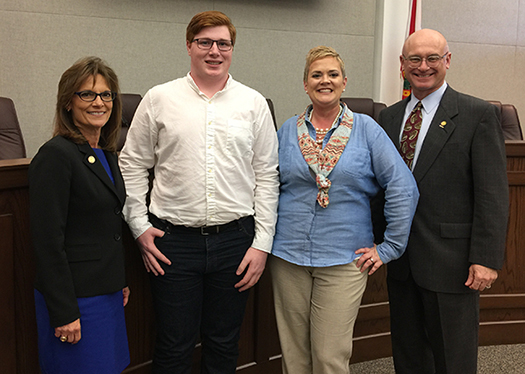 Wyatt Deihl, a graduate of the Okeechobee SWAT Club and current partnership member, spoke about how the SWAT youth are making an impact on tobacco prevention by holding community awareness projects like the lake clean up, Kick Butts Day and Through With Chew Week projects. Deihl also expressed his concerns for the youth of Okeechobee County who are using electronic cigarettes and the rise of popularity of these products over the past few years. For more information on the work of the Tobacco Free Partnership, or to become a member, please contact Courtney Moyett at CMoyett@qQuitDoc.com or visit www.TFP-Okeechobee.org.